You probably know or have met someone who has suffered from a spinal injury. Unfortunately, according to data from the World Health Organisation (WHO), every year worldwide around 250,000 to 500,000 people suffer a traumatic injury of this kind. Spinal injury has secondary complications, such as diabetes or osteoporosis. It entails high financial costs for patients and hampers social inclusion and entry into the labour market. 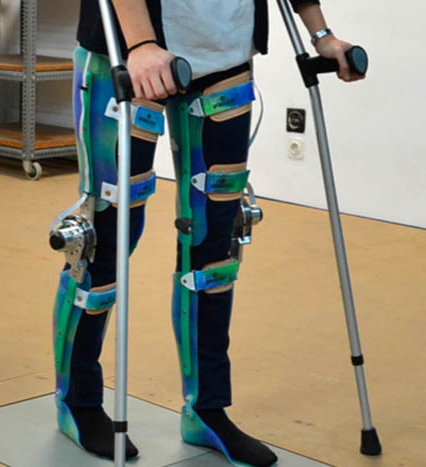 People who have suffered a spinal injury can walk independently if they have a robotic exoskeleton to help them externally move the legs that have been paralysed by the trauma. However, most of the exoskeletons that are currently on the market are expensive, difficult to operate and are not adapted to the patient. This makes it difficult for patients to acquire them and the practice is only used in hospitals and large rehabilitation centres. The Assistive Biorobotic Low-cost Exoskeleton (ABLE), which was designed and developed by the Biomechanical Engineering Laboratory (BIOMEC) of the UPC, attached to the Biomedical Engineering Research Centre (CREB), represents a paradigm shift in current technology. The device is cheaper, light and intuitive and adapted to the functional capacity of the patient. Its design is based on passive supports, which are manufactured in orthopedics and already owned by most patients. To these are added just the essential mechanisms and sensors to facilitate functional recovery of walking. Specifically, the device is comprised of three modular components: a knee actuator system that acts as artificial muscle, a sensor situated in the tibia region that detects the user’s intention, and a rucksack containing the electronics and the battery. This entry was posted in Sin categoría and tagged CREB UPC, exoskeleton, Health, Josep Maria Font on 21 July, 2017 by www-citupc.